What will I find at a SAPO picnic? The heart of an active, productive community is personal, face-to-face interaction. In that spirit, we’ll have a few ways to facilitate conversation and connection. Shared feast: This social is a potluck picnic; please bring your own food, and/or a little extra to share! One of the metal pavilion tables will be set up for shared food items. No glass containers or alcohol, please, per park rules. If you bring perishables that have mayo, etc, you are responsible for monitoring to avoid food poisoning. To be eco-friendly, we encourage bringing your own plates/etc that can be washed and brought home. See "Description" page for details. Literature (brochures, flyers, business cards) from local groups/orgs/Trads: If you would like to share information with the local Pagan community, please feel free to provide SAPO with flyers, brochures etc that we will be happy to make available during the picnic. No commercial advertisements, please - social networking only. Want your photo taken, or not? : We'll have smiley face stickers available to wear to let the photogs know if you're public or not, as well as protecting your children. Photos will be posted on the Net, so please let us know your preference. 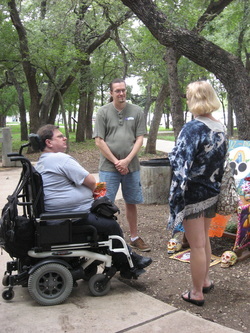 Group Activities: Interaction with others is a key element in strengthening community bonds. See the "Activities" page for details. Questions? Community Project Suggestions? Contact us!